Hello, friends! Just checking in with some news from the Missile Factory. We’ve got a lot of awesome and delectable concoctions coming at you in 2019, and wanted to let you know of a few recent releases we’re swimmingly slurping on these days. 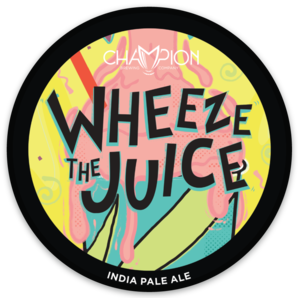 Our brewers went experimenting with Mandarina Bavaria hops and came up with this juice box of a brew. This IPA is a clear pale yellow with aromas of pineapple, grass, and orange hard candy. Juicy flavors of pineapple, citrus zest, and cracker-like malt are balanced out by a brief mild bitterness and dry finish. A dark Mexican lager that is as lively and crush-able as our True Love Mexican lager but with a toasty malt character to compliment the balanced bitterness and slight sweetness from the corn. Sometimes unrequited love is a good thing! A West Coast Double IPA hopped exclusively with the elusive Mosaic hop. Known for its fruity, earthy, and herbal notes, this hop dances well with the peel and juices of blood oranges and red grapefruits. Intensity! A great way to sample what’s new alongside our all-time favorites, Missile IPA and Shower Beer. Currently showcasing Wheeze the Juice and Unrequited Love. And we also dig those Variety Pack stickers, which we grab from custom sticker manufacturer Sticker Mule.